Organicshop.in, an online marketplace for organic products, has raised Rs 30 lakh ($49,370) in angel funding from Rajasthan Angel Investor Network (RAIN). Out of 24 RAIN members, 13 have invested in the startup for 30 per cent equity and the deal saw Organicshop's valuation at Rs 1 crore. As part of the investment, Mahavir Pratap Sharma, co-founder of RAIN and charter member of TiE Rajasthan, will join the board of the startup. The funds will be primarily used for developing a private label brand, marketing and global expansion, among others. "The funding validates our business idea and will give us an opportunity to explore global markets and better branding. 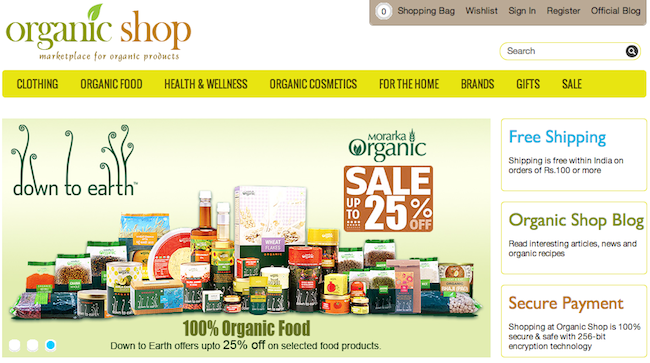 The funds will be used for creating a better customer experience on the website, branding and expanding to the US," said Manuj Terapanthi, founder and CEO of Organicshop. According to the website, the company is planning to venture in Europe and the South-east Asia, and is currently promoting green products via its website in the US. The Jaipur-based startup was set up by Manuj Terapanthi back in 2011. A TiE Rajasthan member, Terapanthi had earlier co-founded Aathitya Travels, a tour and travel company specialising in planning tailor-made Rajasthan tours and small group tours. He holds a bachelor's degree in Engineering from Malaviya National Institute of Technology, Jaipur. Organicshop.in is an online marketplace for certified and branded organic products including food, textile, clothing, cosmetics, and wellness & health supplements. It also offers ayurvedic and herbal products. As of now, the site features about 26 brands and more than 1,300 products. The product range includes a wide variety â€“ right from yoga mats, towels and comforters to organic spices, green tea, grocery, herbal & health products, and organic cosmetics. The company is also planning to launch its own private label brand called Itsorgic for categories like textile and food. While its current team size is four, the startup is looking to hire more people for business development. As far as competition goes, the startup locks horns with a number of companies who offer organic products including Organic Garden, Farm2kitchen.com, Times Internet's Satvikshop.com, Downtoearthorganic.com, NaturalKart.com, FabIndia.com and Natural Mantra.